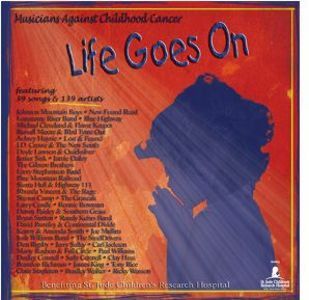 Life Goes On by the Musicians Against Childhood Cancer (MACC) is a new 2 CD set available for purchase at Amazon.com, County Sales, Ernest Tubb Records Shops, the Musicians Against Childhood Cancer website, Rural Rhythm Records, directly through the participating artists and many more locations. Life Goes On was recorded live during the annual MACC festivals from 2006 - 2011 with the exception of the new single "Life Goes On" that was recorded at Randy Kohrs' Slack Key Studio in Nashville, TN. Many bluegrass music artists contributed to the project. Family memory photos are courtesy of the musicians involved in this project and Darrel Adkins. Darrell and Phyllis Adkins founded Musicians Against Childhood Cancer in honor of their daughter, Mandy who lost her battle with cancer on November 25, 2000. Proceeds from the annual festival benefit St. Jude Children's Research Hospital in Memphis, Tennessee. Two Disc Set Includes All-Star List of Talent including: Lonesome River Band, Russell Moore & IIIrd Tyme Out, Marty Raybon, The Grascals, Blue Highway, Tony Rice, Shawn Camp, Josh Williams, Rhonda Vincent, J. D. Crowe, Doyle Lawson, Chris Stapleton, Carl Jackson, Larry Cordle, Jerry Salley, Ronnie Bowman, Brandon Rickman, and many more.